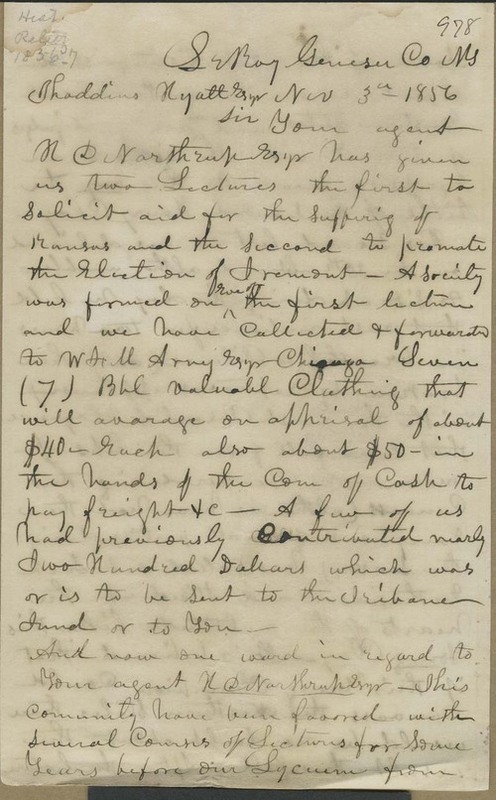 This letter, written by S. Chamberlin, President of the LeRoy Kansas Aid Society, was addressed to Thaddeus Hyatt, chairman of the National Kansas Committee. This aid society in LeRoy, New York, was formed after a lecture presented by H.D. Northrup, an agent of the National Kansas Committee. The author immensely praised the speaking abilities of Northrup, likening him to the great orator Henry Clay. Chamberlin was firmly convinced that, if Northrup canvassed the North, he would be able to stir the hearts of Northerners in support of free state cause. This society also collected clothing and money to send to the free state settlers in Kansas.